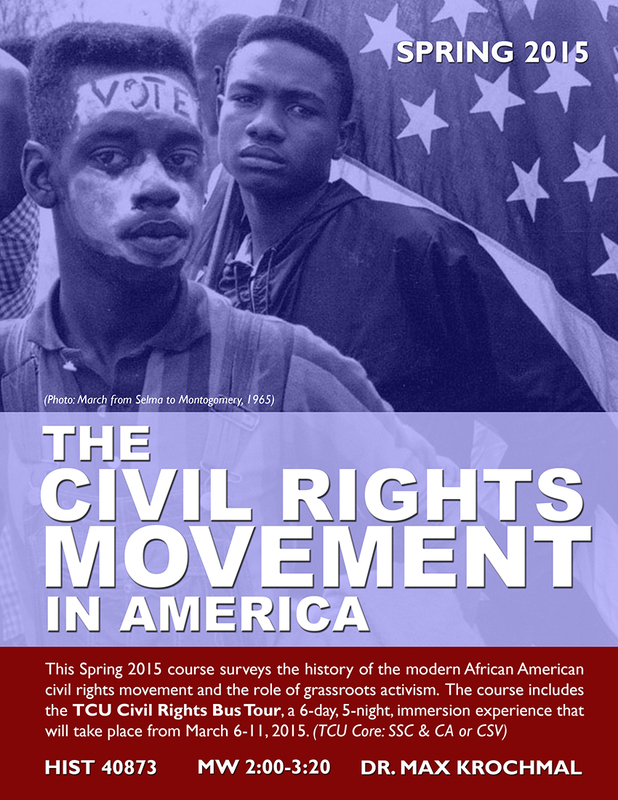 This course surveys the history of the modern African American civil rights movement and uses it as a vehicle to explore the theory and practice of group-centered leadership development; the nature of social movements and the role of grassroots activism; the connections between civil rights and other struggles for social justice, past and present; and the origins and persistence of structural racial inequality in the U.S. Prerequisites: NONE. Core attributes: CSV or CA and SSC. 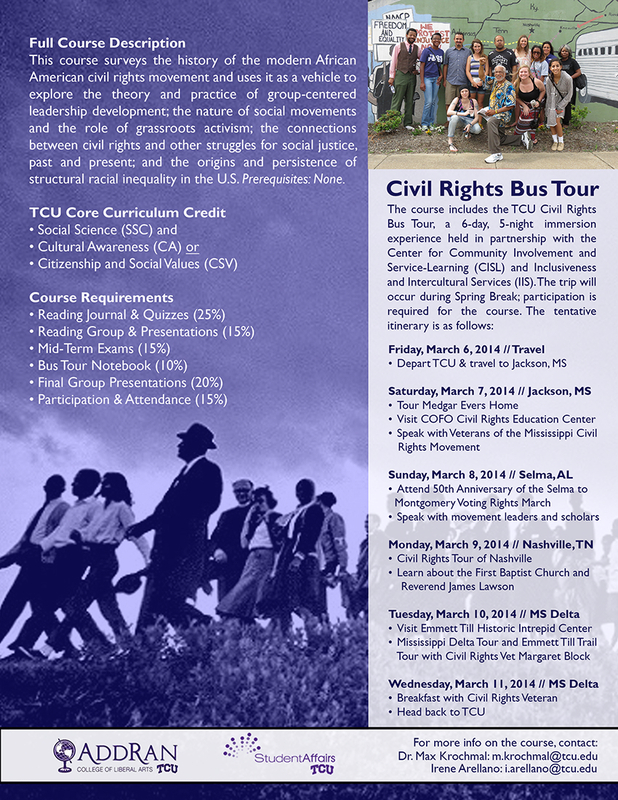 The Spring 2015 course includes the TCU Civil Rights Bus Tour, a five-night field trip in partnership with the Center for Community Involvement and Service-Learning (CISL) and Inclusiveness and Intercultural Services (IIS). Students will visit historic sites related to the movement and meet activists in the black freedom struggle, past and present. In 2015, students will have the unique opportunity to march in the 50th Anniversary Bridge Crossing Jubilee in Selma, Alabama. Other stops will include the headquarters of the movement and home of Medgar Evers in Jackson, the Emmett Till trail in the Mississippi Delta, the National Civil Rights Museum at the Lorraine Motel in Memphis, and sites from the student sit-in movement in Nashville. 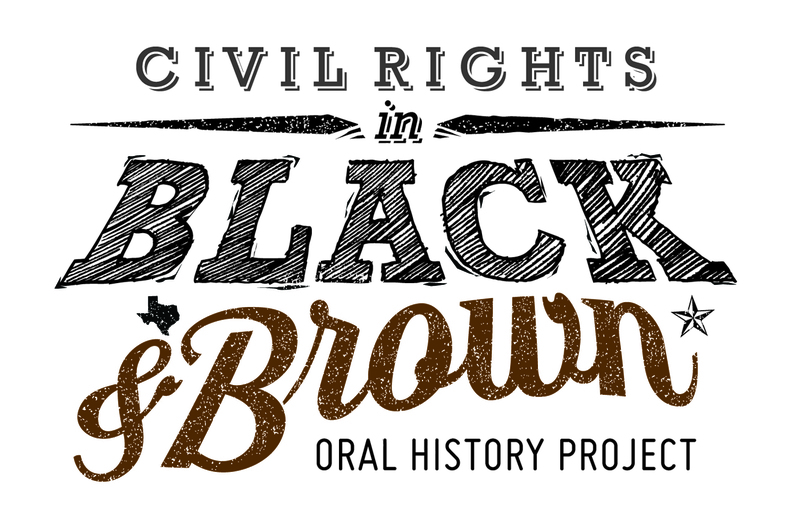 Students will also have opportunities to interact with and learn from the local organizers who built the civil rights movement on the ground as well as activists in present-day campaigns for justice. Click the following links for a testimonial from a past student participant or a piece from TCU 360 on last year’s trip. The course takes place during the normal Spring semester, 2015. We will spend the first eight weeks in the classroom getting ready, then five nights on the road during Spring Break (March 6-11), and then a final six weeks on campus wrapping up and talking more generally about social movements and social change. The course concludes with small-group presentations during the final two weeks of classes, ending on April 29. Since you’ll be giving up your vacation, there will be no additional class activities during finals week. See below for more details on the class (syllabus coming soon). Students can register for the class through my.tcu.edu/. There is no additional program cost beyond your normal flat-rate tuition–you can even take it as an overload for free! The Civil Rights Bus Tour is free for students except for some meals and personal expenses. 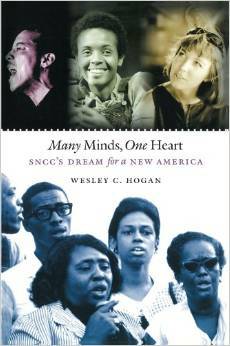 Wesley Hogan, Many Minds, One Heart: SNCC’s Dream for a New America (Chapel Hill: University of North Carolina, 2007), paperback, ISBN: 978-0807859599. 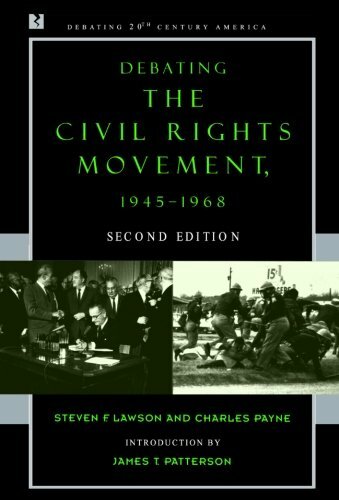 Steven F. Lawson and Charles Payne, Debating the Civil Rights Movement, 1945-1968 (New York: Rowman & Littlefield, 2006), paperback, ISBN: 978-0742551091. 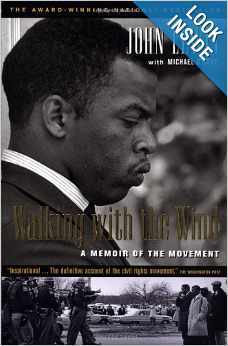 John Lewis, Walking with the Wind: A Memoir of the Movement (New York: Harcourt, Brace, 1998), paperback, ISBN: 978-0156007085. You will also read one biography chosen from a list supplied by the instructors. Additional articles and book chapters will be available on eCollege and in class. The written word is the main currency of historical knowledge. Expect a reading assignment every night (except on the bus tour). Readings must be completed prior to the date that they appear on the syllabus. We will also read primary sources in class. React to the text and points you’ve mentioned – how did the reading make you feel? How does it change what you thought you knew about this part of U.S. history? There will be periodic short pop quizzes on the reading at the beginning of selected classes. These will take place randomly based on my whim. You get a 0 if you are late or absent, and quizzes cannot be made up (you may complete an extra journal assignment). In addition to our common texts, you will read one biography on your own, chosen from a list of approved titles supplied by the instructors. You will be asked for your preferences and assigned the book during the second week of classes. After reading, you will first write a short (4-5 page) essay reviewing the text. Next you will be placed into a small group with other students who have read the same book. The group will meet independently to discuss the reading and will then prepare a short class presentation on the individual under study. Presentations will take place throughout the semester (dates will be assigned at the same time the books are assigned). You will complete a take-home essay exam just prior to the bus tour. It will ask you to reflect on and summarize what you have learned in the first week of class. It is due to the eCollege Dropbox by 11:59pm on Thursday, March 5. It is your ticket for the bus tour and must be submitted prior to departure. There will be no make-ups of any kind. The second mid-term will consist of a take-home essay exam completed after the bus tour. 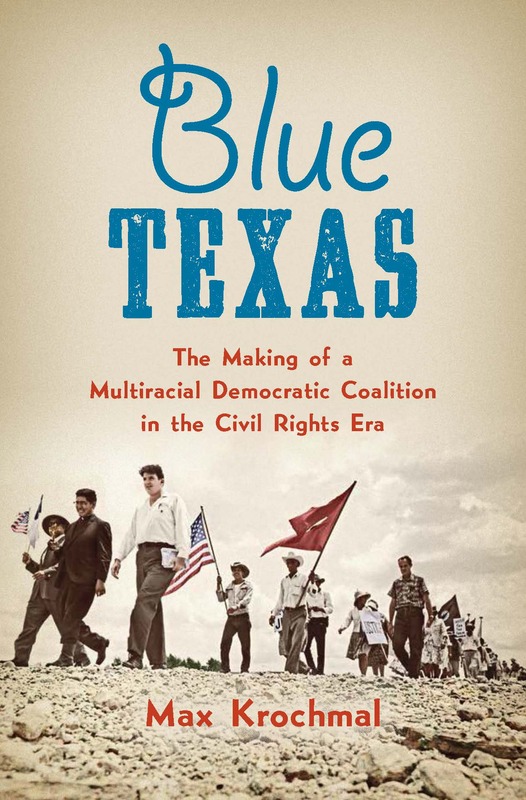 It will ask you to write your own synthetic history of the civil rights movement. It is due to the eCollege Dropbox at 11:59pm on Friday, March 20. From the beginning to the end of the bus tour, you will be expected to take copious ethnographic notes throughout the day and to complete informal written assignments each evening. The notes should fully document your experiences throughout the day: the people and places you observed, the content of our guest speakers’ lectures, the key facts and interpretations presented by museums and memorials, and so on. The written assignments will vary in length and subject, but most will ask you to reflect on your experiences throughout the day in anticipation of our small- and large-group reflection sessions. At times you will also be asked to write and reflect after our group discussions. The final exam will consist of small group projects related to social movements and justice issues. Working in groups of three, students will complete one of two tracks: 1) they may identify a movement, past or present, and examine its history with particular attention to the role of grassroots activists and leadership development; or 2) they may outline plans for a campaign or new organization aimed at achieving social change on campus or in the local or global community. On either track, students will be expected to produce posters and present them on the final day of class, Friday, May 30. Each student will also individually write a short informal paper on one component of their project and other class reflections, due in the eCollege Dropbox by 11:59pm on Sunday, May 3. You are expected to be an active and engaged participant in all class discussions and to complete informal in-class writing and oral assignments to the best of your ability, every time. Participation grades often seem arbitrary; to minimize this, I use numerous in-class activities and small, informal writing assignments (including little homework assignments that do not appear elsewhere on the syllabus). I also require you to turn in your notes on selected lectures, film screenings, small group discussions, and other activities. I will endeavor to give you timely feedback on your standing in this arena.